Make a roux by melting butter, add flour and stir, then cook over low heat for 2 to 3 minutes while stirring constantly. Set aside to cool. Cook macaroni according to package directions. Drain and put into foil pan. 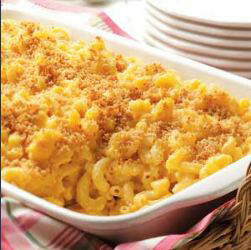 While macaroni is cooking, heat 8 cups milk, add cheeses and cook over medium heat while stirring to melt cheese. Add salt and white pepper. Add roux and stir until well thickened. Add this to macaroni and mix well to coat macaroni. Pour in remaining 2 cups milk. Combine the bread or cracker crumbs with the butter and sprinkle over the top. You may prepare it this beforehand, refrigerate it, and bake it later. Bake for about 30 to 45 minutes hour in 350 degrees F oven.